The N.C. Department of Transportation plans to overhaul a one-mile stretch of U.S. 401 in Garner to try to improve traffic flow and reduce the number of accidents. 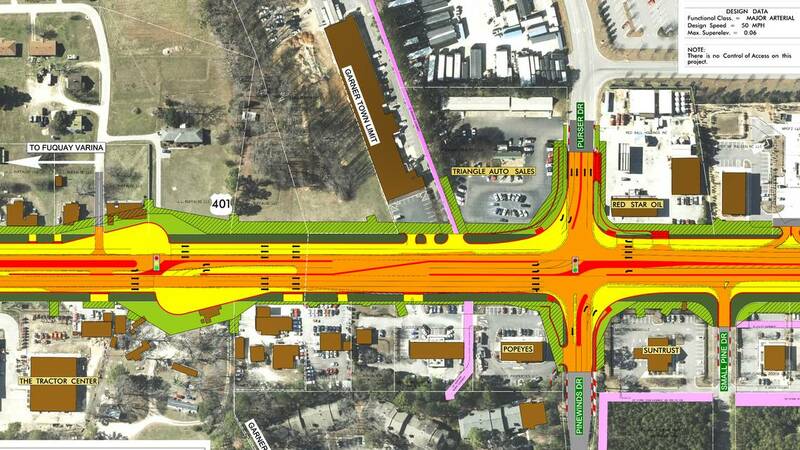 The plan involves adding another lane in both directions and building a raised median that would limit where drivers could turn left in or out of businesses between Old Stage Road and Mechanical and Garner Station boulevards. Engineers call the proposed traffic pattern on U.S. 401 a “superstreet.” The design, which NCDOT plans to use on a growing number of busy roads in the Triangle, reduces crisscrossing traffic by cutting down on left turns in and out of businesses and side streets. In some places, it forces drivers who want to turn left to turn right instead and directs them to a break in the median to make a U-turn. For example, there’s a full intersection now where Purser Drive and Pinewinds Drive meet U.S. 401 near Walmart. Under the NCDOT proposal, drivers would be able to turn left from U.S. 401 onto both side streets, but drivers coming out of those streets would be able to only turn right. The pattern means commuters on U.S. 401 won’t have to stop as often at that intersection, said NCDOT spokesman Andrew Barksdale. As Fuquay-Varina and other parts of southern Wake County continue to grow, the state estimates that the number of drivers using this part of U.S. 401 will grow about 40 percent by 2040, to 67,000 a day. “The bottom line, you have more green time with this kind of design,” Barksdale said. Fewer left turns also should mean fewer accidents. There were 366 crashes resulting in more than 200 injuries along this stretch of road in the five years ending in the summer of 2016, for a crash rate that is nearly twice as high as a normal urban corridor, Barksdale said. Engineers who developed the superstreet design for U.S. 401 expect the crash rate to be cut in half, he said. The NCDOT will accept feedback on its plans for U.S. 401 through Aug. 31. Comments may be sent to NCDOT project manager John Braxton at 919-707-6219 or jwbraxton@ncdot.gov or to consultant project manager Cyndy Yu Robinson at 919-239-7142 or cyndy.yu.robinson@aecom.com. This map shows part of the N.C. Department of Transportation’s plans to widen a one-mile stretch of U.S. 401 in Garner to six lanes and redesign the road to reduce the number of left turns in and out of businesses and side streets.